The Sustainable Jersey Resiliency Program was formed to provide and coordinate assistance to post-Sandy municipalities in New Jersey. While federal and state monies (e.g. FEMA, HUD) helped allay the cost of major infrastructure improvements and housing repair, other significant recovery and resiliency needs remained to be addressed. Non-profit, private and academic institutions quickly came to the scene to offer technical assistance and services.However, many of these “resource providers” were unable to determine which communities needed assistance, and what kind of help they needed. Similarly, municipalities did not know where to find resources to address their needs. ​In early 2013, several agencies and organizations began to inventory the non-profit resources being provided to communities, including the American Planning Association – NJ Chapter, FEMA (Community Planning and Capacity Building), Sustainable Jersey and NJ Future. Later that year, the Sustainable Jersey Resiliency Program was formed to provide a more coordinated and comprehensive approach to community recovery and resiliency. The Program is facilitated by Sustainable Jersey, a non-profit organization at The College of New Jersey, who partners with “resource providers” and matches their tools and services with community needs. 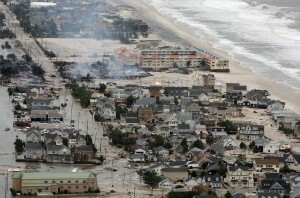 The Sustainable Jersey Resiliency Program receives funding from the NJ Recovery Fund and the Surdna Foundation. In the spring and summer of 2014, staff of the Sustainable Jersey Resiliency Program conducted a broad assessment of municipal needs with local officials from 86 municipalities across the 10 coastal counties hardest hit by Superstorm Sandy. The “Post-Sandy Municipal Needs Assessment for Long-Term Recovery and Resiliency Planning” was designed as a brief, online survey instrument to quickly and efficiently collect insights from local officials. Through a combination of open-ended and multiple choice responses, local officials were asked to provide examples of their top recovery and resilience issues and to identify their level of interest in support services available for a range of commonly cited municipal recovery and resilience issues.